Well, YOU may be ready to move from good to GREAT, however, this course is still a work in progress. I would like to invite you to PRE REGISTER for the online course for $1 - and when it comes online, you will be notified and have instant access. With fingers crossed, we hope to have the Practical Psychology for Business course come online by Christmas! As my gift with your PRE REGISTRATION purchase - I will grant you access to my unique Book Club and a free copy of my book Supercharge Your Emotions to Win! Complete your purchase to get things started. Oh, wait! I just thought of something. I have one more free learning item to share with you - a free mini-course called 5 Distinctions that will set you free! 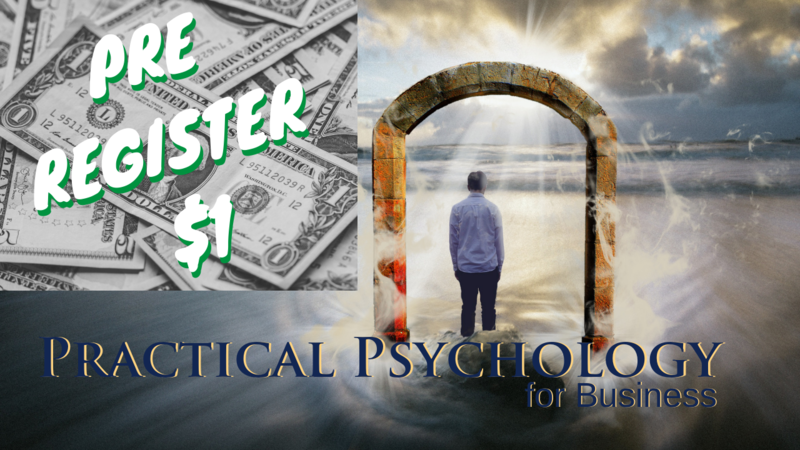 With purchase of this 7-week business success self-study course, you will gain instant access to a higher level of understanding around learning to control the supercomputer between your ears and I will personally guide you through the steps of my proven process to remove blocks in order to increase your performance, help you with your work/life balance, and stress management! Your program includes a series of recorded video messages by Ben, and each lesson is combined with thought-provoking "block-releasing" exercises to help you move successfully from one section to the next. You will learn how to develop the best habits and mindsets that will set you up for success and help you function at your peak = all day, every day. optional 1 to 1 Coaching is available for purchase, per hour, as an add-on offer, or at anytime in the future, via your member portal (look for the nav link at the top of the portal page).